Coast Guard and Other - LamaLo Technology Inc. 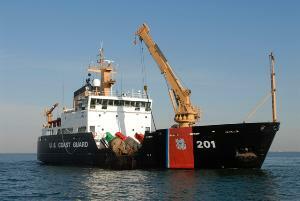 US Coast Guard Fast Response Cutters (FRC-B) are under construction at Bollinger Shipyards Inc. 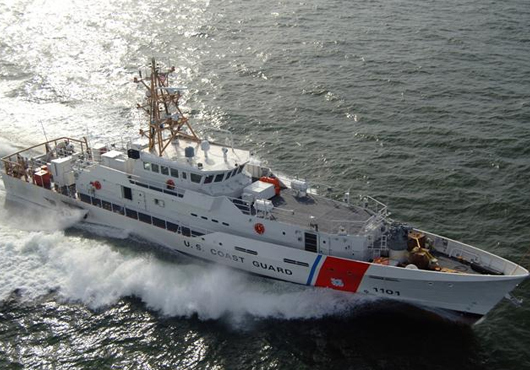 The FRC-B (Sentinel Class) is able to deploy independently to conduct USCG missions, such as ports, waterways and coastal security, fishery patrols, drug and illegal migrant law enforcement, search and rescue, and national-defense operations. The FRC-B is a twin screw vessel, 154' long and capable of speeds of 28 plus knots. The six bladed fixed pitch propellers are directly driven by a diesel engine with a rating of 3800 kW at 2100 RPM through a single reduction gearbox. LamaLo Technology has been contracted by Bollinger Shipyards to assist with the propulsion shafting design, alignment, vibration and powering performance - both theoretical and measurements. LLT continues to support construction and sea trials work. As of October 2017 twenty six (26) vessels have been delivered. The shafting and powering performance of these vessels has been excellent. Three Offshore Fisheries Science Vessels (OFSVs) for the Canadian Coast Guard are under construction by Vancouver Shipyards. The vessels will be 63.4 metres in length with a design displacement of 3212 tons. The vessels will have a single screw propulsion system. The 5 bladed fixed-pitch propeller will be driven by a double-wound electric motor rated at 2250 kW at 135 RPM. LamaLo Technology Inc. (LLT) has been contracted by Vancouver Shipyards Co. Ltd. (VSY) to provide specialized engineering analysis services with respect to the propulsion shaft alignment and vibration on the OFSVs. This includes a review of the design arrangement, finite element modeling of shafting vibration and alignment, development of alignment procedures, and measurement of final alignment. Construction started 2014. 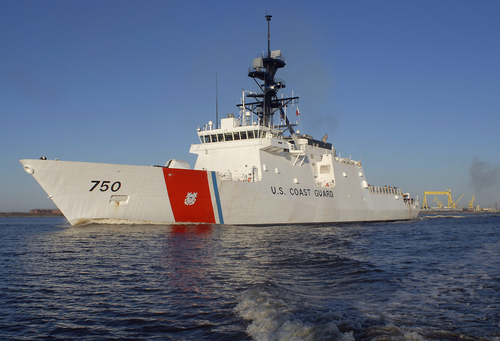 LamaLo Technology has been contracted by the US Coast Guard to review and assist in updating the shaft alignment documentation of USCG Cutters, and to provide long term shaft alignment monitoring for some selected cutters. As of 2014 ten (10) different classes of cutters have been reviewed and updated. Strain gauge based alignment measurements are used to estimate long term bearing wear. The CCGS Gordon Reid was delivered in 1990 by Versatile Pacific, in Victoria, BC. The vessel is an intermediate search and rescue (SAR) cutter and has an overall length of 50 m and a draft of 5.35 m, with a maximum rated speed of 16.5 knots. Each of the two propellers is driven by two diesel engines, each with a rating of 916 kW at 750 RPM, through a twin input – single output gearbox. Each propulsion shaftline is approximately 13 m long, and is supported by water lubricated strut and sterntube bearings and one lineshaft bearing. The vessel was grounded. The propeller blades were broken, and the propeller shaft and rudder stock were bent. A visual inspection of the strut and sterntube bearings indicated no damages. The shaft was not excessively bent and the shipyard straightened the shaft within tolerance. Welding repair was required on the top of the strut frames, which were found to be cracked. 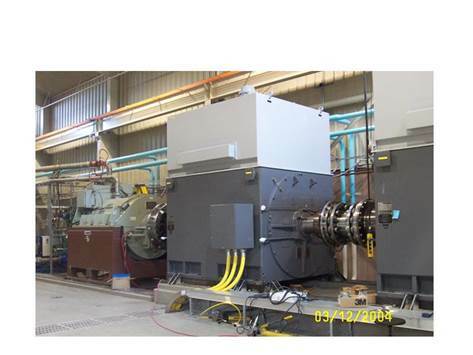 A propulsion shaftline alignment theoretical analysis and measurement program was conducted. The alignment condition was measured using optical, jack-up load, and strain gauge alignment techniques. The port and starboard strut bearings were found to be misaligned such that the aft ends of the bearings were higher than the forward ends and they were horizontally skewed. 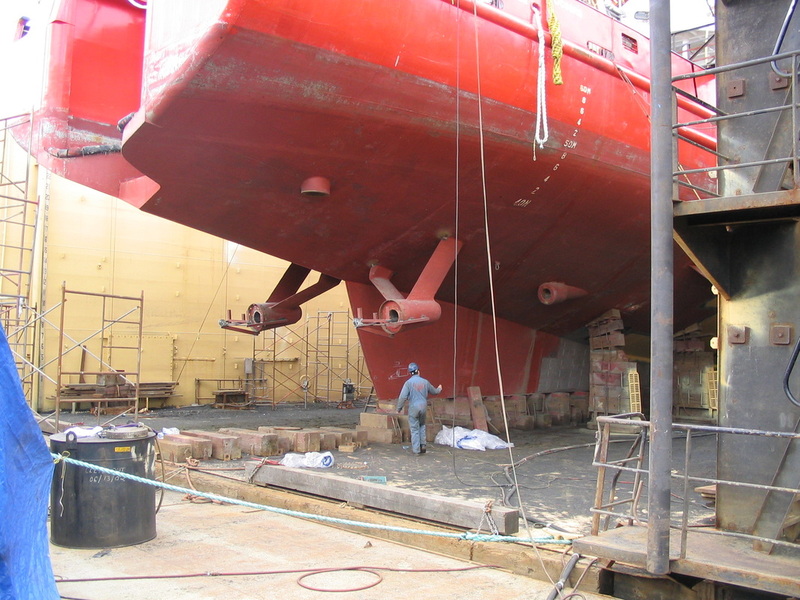 This misalignment was consistent with the damage observed to the shafting and propeller, and would have resulted in damage to the bearings if operated under this condition. To correct for this misalignment the port and starboard strut bearings were replaced with new bearings and realigned to be concentric, parallel and in line with the gearbox output shaft. With the vessel afloat, the shaft was realigned by adjustment to the lineshaft bearing. The subsequent alignment measurements showed acceptable loads on the gear shaft bearings. 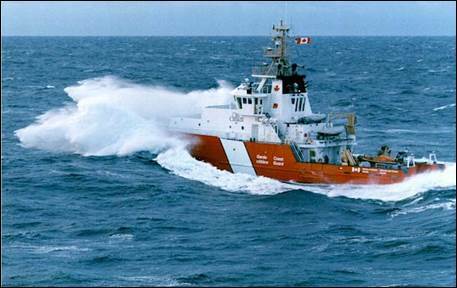 The CCGS Gordon Reid underwent sea trial the in April 2004. It has been reported that no significant shaft vibrations were present and all bearing temperatures were acceptable. National Oceanic and Atmospheric Administration (NOAA) 40-Day endurance fisheries research vessels (FRV40-1) are under construction at VTHalter Marine Moss Point Yard. The vessels are 209' long with a beam of 49', a draft of 19.3' / 30.0' (center board up/down), a full load displacement of 2,240 metric tons, and a design speed of 20 knots. The ships have a range of 12,000 nautical miles, a trial speed of 14 knots, and carry a complement of 39 persons. The vessels have a single screw propeller configuration. The 5 bladed fixed pitch propeller is driven by two tandem DC Motors, each rated at 1150 kW at 134 RPM. The propulsion shaftline length is about 49' long, and is supported by one sterntube bearing, one intermediate shaft bearing, and one support bearing on the thrust shaft. Each of the two motor rotor shafts is supported by two bearings. LamaLo Technology was contracted to conduct a theoretical propulsion shaftline alignment and vibration analysis, provide the propulsion shaftline installation and alignment procedures, and to measure and assess the shaft torsional and lateral vibrations during sea trials. The strain gauge technique was used to conduct the final alignment prior to chocking. All four (4) vessels were delivered by 2009. LLT was contracted by Marinette Marine Corporation to conduct similar work for the fifth vessel of this class (NOAA FSV-6). This vessel was delivered in 2013. 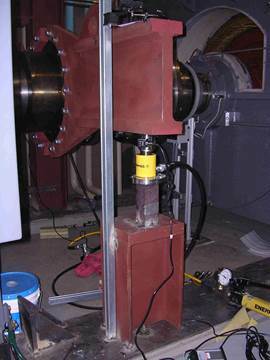 A static physical calibration was conducted on the torque strain gauges. Torque was applied by two hydraulic rams pressing against two opposite arms mounted on the flange of the shaft, providing a pure torque load. A static torque was applied to the shaft of up to 303,000 ft-lb. Both a clockwise and counter-clockwise torque was applied. The error in the value of the torque calibration factors was calculated to be less than 1% of full scale. The linear regression coefficient (R2) was better than 0.9994 for all the tests performed. 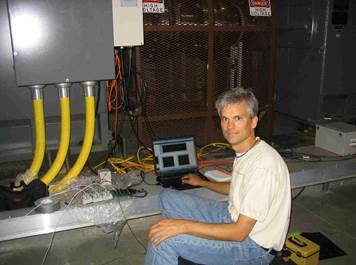 A full power test was conducted in 2004 on the Test motor. The shaft vibrations and alignment condition were acceptable. 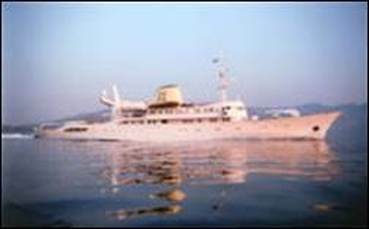 This vessel is a legacy to the late shipping magnate Aristotle Onassis. The vessel is named after Onassis' daughter. An upgrade to the propulsion system was conducted in 2000. LamaLo Technology was contracted to conduct a theoretical propulsion shaftline alignment analysis, and to provide the propulsion shaftline installation and alignment procedures. A brief assessment of the potential for excessive shaft vibration was also conducted. The vessel refit was conducted in Croatia in October 2000.